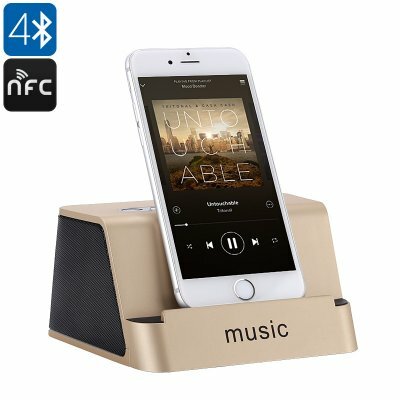 Successfully Added Bluetooth Speaker - 1200mAh, NFC, Built-In Mic, 10m Range, AUX Interface, 2x 3W speakers, 8GB SD Card Slot to your Shopping Cart. Enjoy great audio while listening to your favorite tracks with this beautiful Bluetooth speaker. This gizmo comes with an SD card slot, AUX interface, Bluetooth, and NFC. Thanks to this, it provides you with plenty of ways to listen to your favorite tracks. Simply synchronize it with your smartphone and hit play. With its two 3W speakers, this cool electronic gadget brings forth an outstanding audio experience. From now on, you’ll be able to enjoy high-end stereo-like audio via your smartphone at any time of the day. This Bluetooth speaker comes packed with a 1200mAh battery. With this cell, it lets you listen to music for up to 10 hours. When running low on juice, your Bluetooth speaker can be easily recharged via its micro USB input. The speaker itself features a simple design that lets you browse through your songs and adjust the volume with the touch of a button. Even when your smartphone is not around, this beauty lets you listen to your favorite tracks via its 8GB SD card slot. Therefore, you’ll never have to be left without music again. The Bluetooth speaker comes with an intergraded microphone. This lets you engage in hands-free phone calls. Thanks to its 10m Bluetooth range, you’ll even be allowed to walk through the house with your cell phone at hand without disturbing the audio. If you are looking for a gadget that lets you enjoy your music no matter where you are, this Bluetooth speaker is perfect for you.